Wearing faux fur is timeless winter trend that really began in the mid-1990s. Our obsession with the fluffy stuff is yet to wane decades later. Heated debates have long arisen over the use of real animal pelts in fashion. All the while, the overall aesthetic is not in question. Consumers still want to emulate the glamour with friendlier faux-fur. Major fashion houses such as Burberry, Coach and Gucci have openly pledged to be working towards a “Fur Free” line, this doesn’t mean that their collections were without fuzz. Faux-fur coats were seen on many a runway and in some cases the faux-fur didn’t stop there. 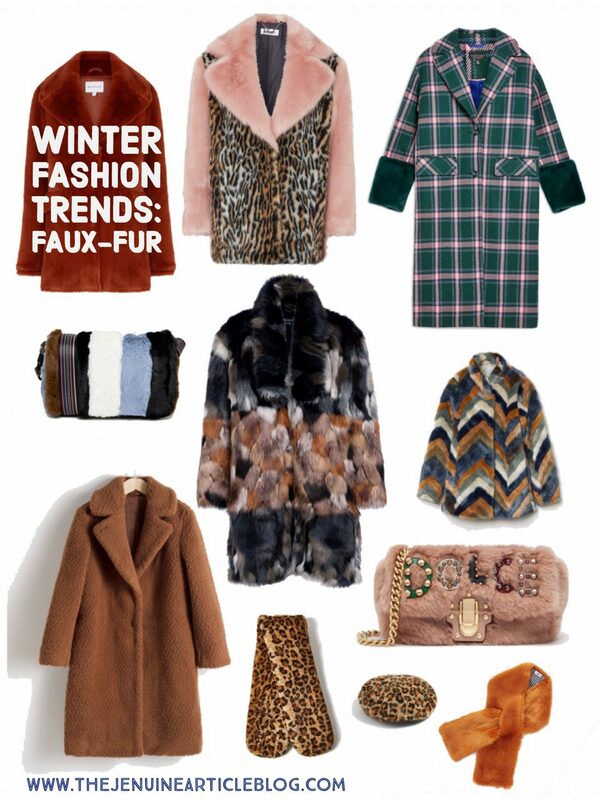 Faux-fur was seen on clutches, totes, hats and stoles, it even made an appearance on the occasional sweater. 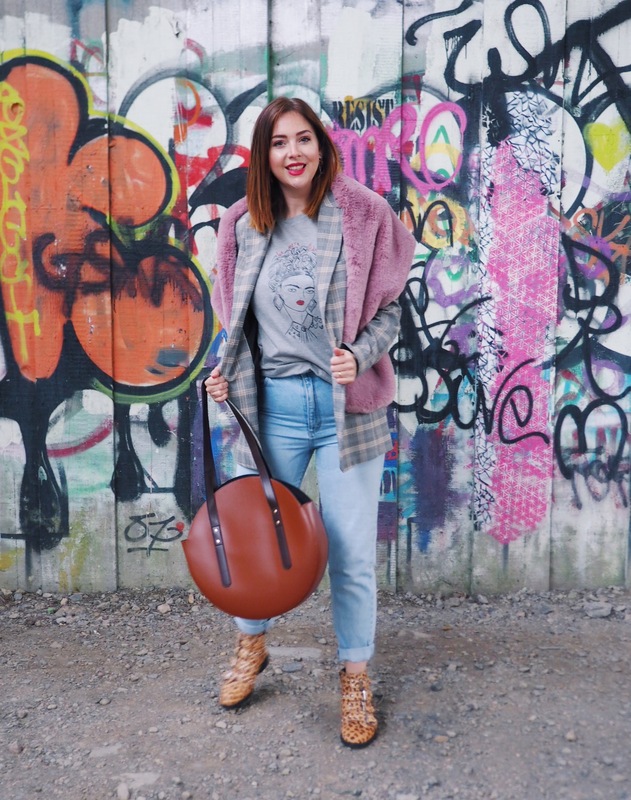 If wearing faux-fur really isn’t your thing, be sure to check out my other posts regarding Autumn/Winters major trends. Including my “forever favourite” animal print or the one with the boots I can’t get enough of. For outfit details see next picture. We are in the midst of a turning point in the world of fashion. The anti-fur movement isn’t one coming from designers alone. Net-a-Porter, a fashion retailer specialising in high-end luxury items has vowed to no longer sell fur. Where Net-a-Porter leads, many fashion retailers are likely to follow. Along with the fact that so many influential designers have long been fur-free (Armani, Stella McCartney, Tommy Hilfiger and Ralph Lauren to name a few) and with increasing numbers pledging to reduce and hopefully eliminate the use of fur in their collections. I am hopeful to see a complete end to the use of fur in the commercial fashion industry in the not to distant future. 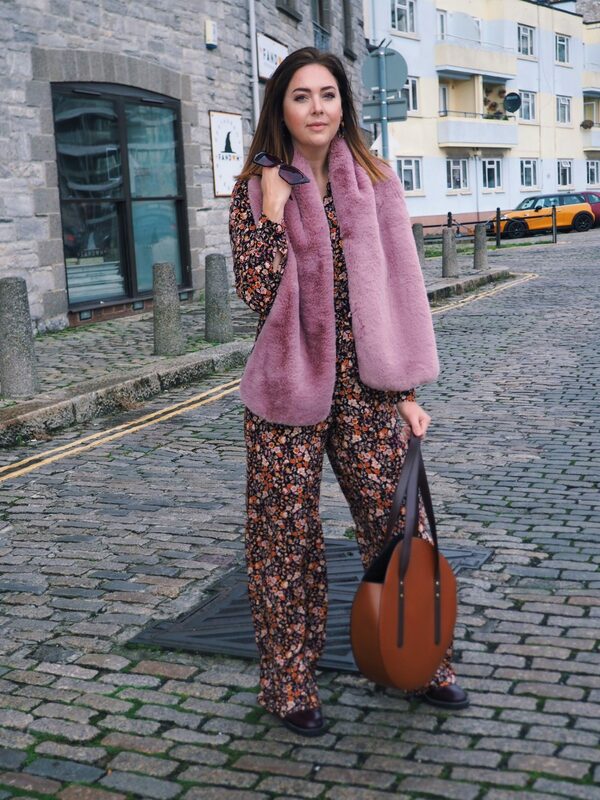 As faux-fur has dominated Autumn/Winter 2018 runways, the trickle down effect has seen our high street absolutely full of some wonderful faux-fur pieces. Ahead, you’ll learn of the most flattering and lust-worthy ways to wear faux-fur and i’ll be sharing my top picks to buy now. Nothing compares to a big fluffy, cuddly number in terms of feeling cosy and warm. When it comes to looking on-trend when wearing a faux-fur coat this season you can go one of two ways. Channel your childhood teddy bear or in the words of Maggie Bullock for Vanity Fair, aim for “Both haute and a little haughty, with just the right hint of Mob Wife”. Models were wearing Faux-fur accessories at fashion month in every shape and form. From totes to backpacks in every colour imaginable. Jeremy Scott delivered boldly with neon hues, whilst Dries van Noten delivered autumnal shades, served up in a shaggy style. Dolce and Gabbana adorned faux-fur totes in bling. Oscar de la Renta suspended smooth and sleek faux-fur from statement chains. It would seem there are no rules to rocking a faux-fur bag this season. Whatever your personal style there will be a bag out there to match it perfectly. It seems obvious, the easiest way to maximise wear of a faux-fur bag is to go for traditional styles in neutral shades. Wearing my c-section “shelf” with pride! Whether it be a chic beret, a fun bobble, wearable headband or not headwear at all, small accessories are a easy way to give a nod to this trend. For me, a hat is one of my favourite ways to refresh a look and its often a more affordable way to keep up with fast fashion. Plus, it seems many A-listers, models and influencers have also had the Faux-fur accessory memo with many rocking the “ever classic” Winter look of a Hat and Sunglasses. Whilst the baseball cap is no longer as much of a hot commodity as it was in 2016, the Winter 2018 revamp sees baseball caps reinvented with the use of more luxurious, heavy material and the addition of a faux fur pom. Though baker boy or beret style headwear is by far the biggest hitter in terms of style kudos this Winter. How to Wear Faux-Fur for any Occasion? Wear faux-fur anytime, day or night. Daytime calls for all the cosy vibes. Oversized knitwear and chunky boots. Mix in other textures such a leather/pleather and add multiple layers, creating interest and depth. A side helping of hot chocolate/mulled wine or cider is optional, but highly recommended. For the evening, dial up the glitz by pairing with silk or satin. The addition of faux-fur would make any sequin number you’ve seen for the Christmas do’ look even more glamorous. Faux-Fur has to be one of the biggest trends of Autumn/Winter 2018. This is understandable, as we head into deepest darkest Winter. If you’re anything like me, it will require ALL of your will-power not googling “Last minute Winter sun” every five minutes. Personally, I have come to accept that being inundated with Vitamin D isn’t a challenge I will be facing anytime soon. Instead, I’ve found joy in the warmth of faux-fur. Most importantly, whether you are wearing a faux-fur coat, small accessories or even just giving a nod to the trend with faux-fur accents. It is certain you will be at your most cosy and stylish. A winning combination during the festive season I’m sure we can all agree. What is your favourite way to wear this trend? Some of the items styled in this post have been gifted free of charge. I am under no obligation to share these items in this format, I choose to do so because I genuinely love them. Brilliant article Jennifer ! Nice to see clothing that doesn’t break the bank and looks as good if not better than the designer clothing that in my opinion is just ridiculously priced and not worth the price tag! I cannot abide these people who buy designer clothing and who think they look better than the women wearing clothing from the high street! This issue with women and menwho just buy the designer clothing and leave the tag on show so they think it impresses us in my opinion are just really trying to make themselves feel better due to them having a lot of insecurities but i bet if you had to racks of clothing that had no labels showing and they were asked to pick the clothing thdy liked best they would more often than not choose the hight street! As long as it fits nicely and you feel comfortable in it then why spend more than you need too!